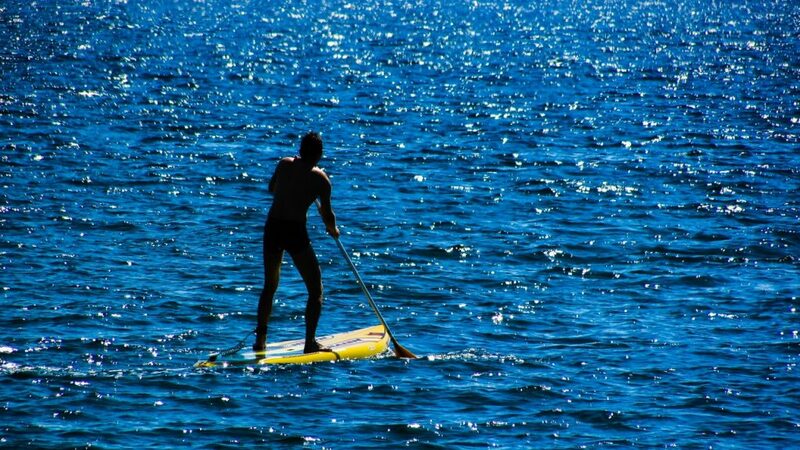 Paddleboarding has been gaining popularity over the past few decades, especially in tropical resorts such as Maui, Hawaii, and others. It is a fun way to connect with nature and relax while hanging out with your friends. 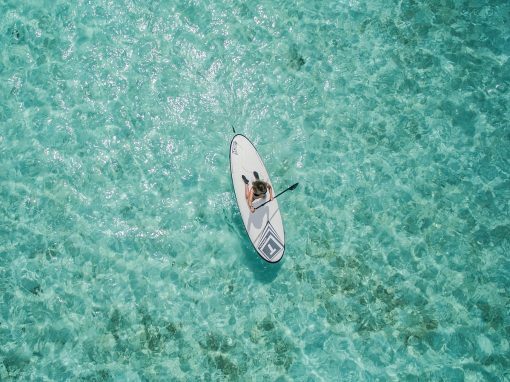 People often say that it is a difficult task to stay on your paddleboard, but we think that with a little reading upfront you can master this activity faster than you’d think. We will teach you the proper stand-up paddleboard techniques by providing a step-by-step approach to the matter and giving some useful tips you can use when out in the ocean. Let’s start from the very beginning. 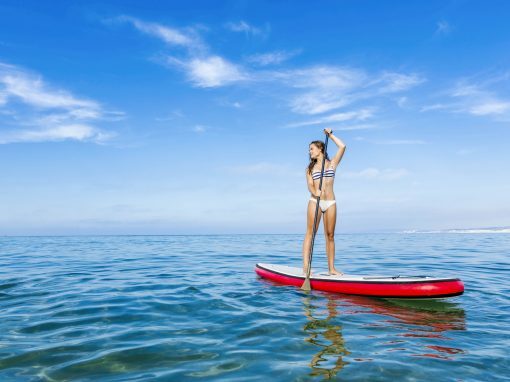 The first thing you will do is pick the right paddleboard for you. You can check out our article on some of the best paddleboards out there. There are many types and each one is good in a way of its own so choose the one which is the right for your type of activity. If you are interested in building your own paddleboard, though, we got the perfect article for you. You can learn more about paddleboards and the process of their making here. Next thing is getting on the board and then getting on your feet. Let’s go through this whole process step by step. Firstly, what you need to do is find calm waters. It will be much easier for you to learn when there are no waves bothering you. Then, get on the board and get on your knees. You need to position yourself in the center of the board and put the paddle in front of you across the board. Try feeling the water. Relax. Examine your surroundings. Start getting up by placing one foot on the board. Find your balance and then place the other. When standing up, get the paddle in your hands so you don’t have to bend to it after you’ve stood up. At this point, you are already standing up. Remember to keep your core muscles engaged. Your knees need to be slightly bent while your feet must remain at shoulder width. That’s it! You are standing up. This is the first big challenge for a novice paddleboarder and you have already passed it. Know that when the board planes or moves slightly in the water it will become more stable. Take a few strokes with the paddle before getting up if you will feel more comfortable this way. Now, let’s get into the more complex part of this activity – the actual paddling. As with standing up, you will need to stay relaxing during this part. Keep your knees bent – this will stop your body from getting locked and will improve your balance and mobility. Furthermore, when your knees are bent you will be able to move with the board, which will make falling harder. Oh, a quick side note on falling – just let it happen. Don’t feel bad about it. Honestly, it happens to everyone, even the best paddleboarders. The great news is that whenever you fall the beautiful blue ocean will be beneath you creating a pretty smooth landing site. If you try to resist the fall you might end up falling awkwardly on your paddleboard which will ultimately cause more damage to you. On the topic now. When holding the paddle, stretch your lower arm out while using the top hand to actually guide the paddle. Don’t place the blade directly next to your paddleboard or you might hit it and lose your balance. Pull through the water while bending at your waist. When the blade reaches the line of your feet, pull it out of the water and go for it again. Make sure you are using the correct side of the paddle. Most paddles are flat, but there are some which are kind of concave. It is easy to remember which side to use when you imagine stroking with your hand. You would do it with your palm facing the water, right? Well, same goes for the paddle. Use the side of the paddle with the larger plane to face the stroking direction. Another important thing is to maintain your momentum. In many ways, this is similar to trying to ride a bike. It is important to maintain your speed above a certain minimum to not fall over easily. The forward momentum aids in your overall balance, so try keeping it at a steady pace. One final thing to keep in mind is to use long, straight strokes. Many beginners tend to “poke” the water. These short strokes won’t build much momentum and will make falling easier. Try to paddle with long and straight strokes. Keep your arms extended so that you can reach far out in front of you. Take long and purposeful strokes and propel yourself through the water at a constant speed while keeping your arms straight throughout the entire process. This stroke technique is perhaps the most universally used. It allows you to move straight forward without having to switch the paddle from one side to the other. It will take some time to master it but trust us, it is totally worth it. Start stroking like you’d normally do but as the blade reaches the side of your feet twist the front of the blade away from the board instead of pulling it out. Make a strong twist, otherwise the water will slap the blade onto the side of your board. After a short pause, repeat the stroke. When using the regular stroke your paddleboard nose will point to the opposite side of your stroke instead of being in a perfectly straight line. The J-stroke (with the “J” movement at the end) realigns the nose. Pro Tip: This stroking technique gets easier with the momentum you build so don’t be afraid to test it out at higher speeds. Standing a little behind the center of the board will also help with the actual stroke. Paddleboarding can be a challenge to learn but if you follow our steps carefully you will learn how to go through this whole process without an issue. 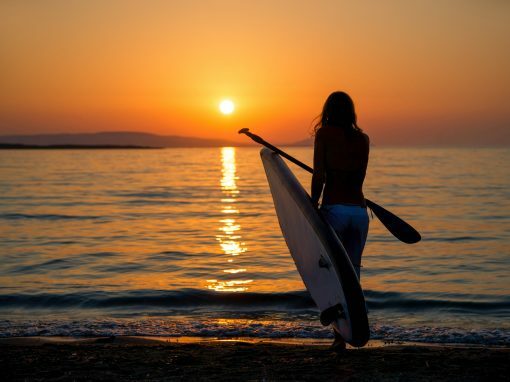 At the end, after mastering the right stand up paddleboard techniques, all that will be left for you will be to enjoy your time on top of the board while also having a great time!